Tactile graphics is a notoriously difficult area in the education of congenitally blind children, and yet, since so much information vital for the correct functioning in this, predominantly sighted world, is available as two-dimensional visual displays, tackling the problem of making this information accessible to blind people becomes an urgent task. The aim of this paper is to show how tactile graphics can be incorporated into teaching programmes for different subjects and into leisure activities, and how a structured course in production and recognition of tactile drawings can be made more effective and more enjoyable by making use of some high and low tech devices, as well as with the help of some do-it-yourself tools. Of the adult population of blind people in Poland, and probably in other countries as well, very few feel confident with tactile maps and diagrams. This is quite understandable if we accept a rather obvious link between the amount of exposure to tactile graphics in early years and efficiency in using such graphics. While sighted infants and children have practically unlimited access to pencils and scraps of paper, blind children and their teachers are severely disadvantaged by the cost, or lack of such basic materials as German film on which raised lines can be produced with an old biro. But as new technical resources for producing and reading tactile graphics become available, there is little excuse for not giving blind people yet another way of communicating with the sighted world and accessing information stored as graphic presentations. While maps of continents and countries, city maps and layouts of buildings are the most obvious uses for tactile graphics that come to one's mind when one thinks of blind users, the educational potential hidden in raised lines and textures goes far beyond such displays. Opportunities for introducing raised pictures are numerous, no matter what subject is taught. Geometrical figures, cross-sections of single cells and of whole living organisms, machines, diagrams, graphs and drawings of everyday objects, plants and animals - all of them are an important component of the education of sighted learners, and all of them can, and should be made accessible to a blind child. All of them can be introduced in the form of games, tasks and leisure activities which, in addition to teaching graphics, will encourage a blind child to explore and enjoy the exciting world "out there". Textures, outlines, solid and broken or dotted lines introduced in such activities will be invaluable in helping the blind child understand the significance and meaning of these devices in tactile maps where they are used to represent stretches of land or water, buildings or continents, boarders, roads and rivers. My own interest in tactile graphics stems from my interest in teaching English as a foreign language to blind children and goes back to the day when I realised how modest and uninspiring the materials I had for my blind pupils were, in comparison with those available for sighted children. Pages and pages of Braille dots could hardly compete with colourful pictures bustling with life in the print version of our course book. In search of new, stimulating materials, sound and tactile graphics came to aid, helping to solve some, and creating new fundamental problems. The two vital questions which anyone involved with teaching tactile graphics must be able to answer are: 1. What, and how much to teach?, and 2. How to teach it? - the ability to interpret spatial relations between objects, as well as the relation between the child and surrounding objects. - the ability to interpret the relation between three-dimensional objects and their two-dimensional representations. Susanne Millar's (Millar 1994) intuition, that movement is the key to the understanding of distances and spatial relations by blind children, is confirmed by a remark made by a congenitally blind girl who, in a spontaneous conversation initiated by my pupils, about sight and blindness, said: "I think I know what it is like to see. It is like telling the future, because you know now that there will be a tree, and I will know later, when I come up to it and touch it. But movement, as S. Millar strongly emphasises, is also crucial for a blind child's understanding of spatial relations characterising three-dimensional objects and their two-dimensional representations. For an average sighted person, it is difficult to understand that a simple drawing of a table represented by means of three lines may remain just three lines for a blind person. This will no longer be surprising, however, if we make the effort to understand a blind child's path towards acquiring the concept of a table. The small hand moves along the edges of the tabletop, then brushes over its surface and moves on to examine the four legs. With each new position of the "comprehending hand", the rest of the table disappears and continues to exist as a memory of a series of tactile impressions, and, which is perhaps even more important, as a series of movements of the child's hands examining the object. A small model will help the child grasp the spatial relations among the different parts of the table but will not bring the child any closer towards understanding how a sighted person can recognise it in a graphic representation consisting of just three lines. Just as puzzling as it is revealing for a sighted person, was the drawing of a London double-decker made by a blind English girl, who chose to represent it by means of just three lines - one for the step she climbed to board the bus, one for the hand rail and one for her seat. This picture was just as accurate as it could have been, given that the girl had no interest in, and perhaps poor awareness of the existence of those elements of the bus which she had no experience of. All of this suggests, that attempts to supplement a blind child's educational materials with complex maps and diagrams must be preceded by a series of structured exercises which will help the child understand, and feel confident in interpreting the relation between three-dimensional objects and their two-dimensional representations as well as the spatial relations involved. These exercises, involving both producing and interpretation of graphics, combined with "life situations", will provide a good basis for understanding tactile graphics representing both familiar and new, unfamiliar environments. In what follows, I would like to share with you the various materials, ideas and innovations which I have found extremely useful in English language lessons, and which, I believe, can contribute towards a better understanding of tactile graphics by blind children, and can supplement any regular, structured course in tactile, two-dimensional displays. The materials which I would like to show have been arranged into groups, according to the educational goals they are trying to achieve and the techniques used for the purpose. Explaining the relation between three-dimensional objects and two-dimensional representations. In order to help blind children understand how a three-dimensional object can be drawn on a flat sheet of paper, and how a simple outline can represent the whole object for a sighted person, a simple tool was constructed, consisting of models of familiar objects such as table, chair, bed and a house, and thin sheets of plywood (the size of an average sheet of paper) with "slots", that is contours of these objects, cut out in such a way that each of the objects can comfortably slide into the matching contour slot, as if the models were being pushed into a sheet of paper, revealing just a raised contour. Tactile drawings of these objects accompanying the models allow the child to compare them with frontal views of all models. A set of flat geometric shapes, mounted on soft magnets can be a very useful tool for explaining the concepts of triangles, rectangles, squares, half and full circles. Raised outlines of these shapes, made on "swell" Minolta, or Flexipaper and placed on a metal pad, provide an opportunity for exploring the shapes and for fitting them into matching outlines of each of the shapes. In an English language context, or, for that matter in a maths lesson, English coins provide another exciting tool for learning to interpret outlines of shapes. Raised outlines of long chains of different coins can be used to represent all kinds of "wriggly" creatures such as worms and centipedes, providing an opportunity to calculate their value by filling each segment with a matching coin. A similar exercise involving raised triangles and rectangles is a good introduction for building "imagined" geometric shapes built with just coins representing the corners of these shapes. 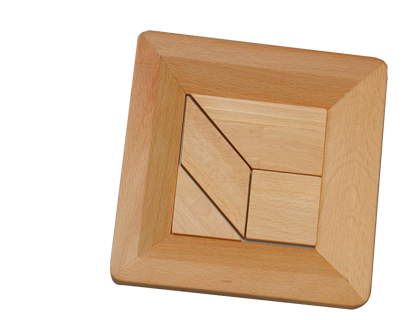 An alternative version of this game can involve the children themselves, who arranged into groups of three or four can "build" human triangles or rectangles. Metal pads, shapes mounted on magnets and raised outlines of geometric shapes made on "swell" paper, provide a useful set off tools for showing how more complex shapes can be analysed into smaller components, or, how different geometric shapes can be used to build other shapes. Raised outlines of two triangles making another triangle, a square or a rectangle, and matching solid shapes, are a good introduction to a more difficult exercise in which more than one shape must be used to fill outlines of large triangles, squares and rectangles. A combination of these devices models of objects, flat shapes mounted on soft magnets and raised outlines made on "swell" paper and placed on a metal pad, provide a useful tool for recognising familiar geometric shapes in real objects and models, such as houses or sailing boats. Exercises in which the children identify familiar geometric shapes in models of houses or boats and then fill in their outlines, provide both entertainment and useful practice in relating objects to two-dimensional representations. This set of exercises is intended to give young blind learners practice in recognising and tracing different lines and textures. Raised lines solid, dotted or broken, joining two points may, but need not run across areas of different textures, depending on the complexity of the task and the experience of the learner. Typical tasks would require the child to help someone find the way home or a lost object, to be found at the end of a particular line. Teaching a foreign language, or, in fact, any other subject, provides a range of contexts which can be used to develop both useful and entertaining exercises in tactile graphics. Adding sound to tactile graphics is invariably a special treat for blind children. This can be achieved either by providing a story commenting on the various stages of producing complex graphics, or by employing the existing technology which will add life to graphics designed by the teacher or produced by the children themselves. The story of a teddy-bear which tries to guess what it is going to be as it is being drawn is just one example of combining story telling with graphics, A real teddy and flat shapes on magnets which can be assembled into a teddy-bear will provide additional entertainment and practice in tactile graphics. The "Tuttorette", one of the range of card readers, is particularly useful for teaching names of shapes and for various exercises involving simple graphics. Again, foreign language teaching and practically any other subject will provide many opportunities for employing this simple but extremely useful tool which allows both the teacher and the child to "sign" the graphics with their own voice. Voice and sound effects can also be added to graphics with the help of a slightly more sophisticated tool such as the Concept Keyboard. With one of the range of user friendly software, the teacher can design an exciting lesson involving raised graphics within minutes, and can add sound which will bring the tactile overlays to life at the touch of the child's finger. The overlays may include models or graphics, or a combination of both to suit the needs and the purpose of the lesson. The possibility to add sound to graphics produced by the children themselves is particularly important and works as an irresistible incentive and encouragement to draw even for children who, initially, did not show much interest in graphics. Adding voice to graphics is particularly useful in mobility exercises involving maps. There are a number of sources which can provide inspiration and useful hints for mobility activities involving both immediately accessible space and large areas. Ron Hinton' s (Hinton 1966) exercise in drawing the layout of a hamster cage is a good example of how such an exercise can be implemented. But there are other small spaces which can be used for giving the child practice in locating objects with the help of a tactile layout - e.g. the child's table mat, successfully used as a tactile map "starter" at the Laski school for blind children in Poland. Mastering layouts of tabletops and desktops will help the child move on too rooms, flats and still larger areas. Adding voice to maps involving such activities by redesigning them for the card recorder or the Concept Keyboard, will not only make these activities more enjoyable, but will give the child an extra sense of independence, the importance of which cannot be overestimated. All of this requires a lot of work from the teachers who decide to use tactile graphics as one of the educational tools. But just as big is the effort which must be put into designing and implementing such materials, so will be, if not bigger, the reward - a confident, independent blind user of tactile maps and diagrams, who will not have to say what one hears only too often from blind people confronted with any tactile two-dimensional displays: "If only I had been taught tactile graphics when I was a child".